Last week I posted a sugar cookie recipe which contained lime juice and lime zest. My apologies. I was not aware of citrus allergies. My post the week before was for peanut butter cookies which I know for some is a culprit. From here on, I’ll try to take that into consideration when posting. 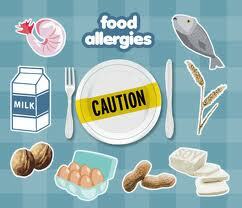 The peanut allergy came front and center to my attention recently when we went out to dinner with friends. We ordered chicken wraps for an appetizer. After a few bites the lady who was with us asked if anyone tasted peanuts in the wrap. We agreed. Soon her ears began to itch, then her eyes. After we left the restaurant, we headed for their home for desert. My husband and I rushed to the drugstore for some Benadryl to counteract her reaction. I asked the pharmacist which product to buy. She advised me that if my friend’s throat was swelling closed to buy the children’s liquid. If she experienced other reactions, to buy the pills. By the time we got back my friend had lost her lovely dinner. She took the pills which seemed to help. We left and she went to bed. I don’t know why I didn’t think of Benadryl sooner. When one of our sons was small, he seemed to be allergic to many things including food coloring, additives, and preservatives. In the course of treatment for those allergies, the doctor instructed me on the use of Benadryl to combat any allergic reaction. For those of you allergic to any substance, please carry a supply of Benadryl with you at all times. You never know when an offending ingredient might pop into your palate.